Our volunteers are the backbone of the RMBF. They provide vital support to our beneficiaries and help to promote our work throughout the medical profession so that doctors and their families know who to turn to in times of need. 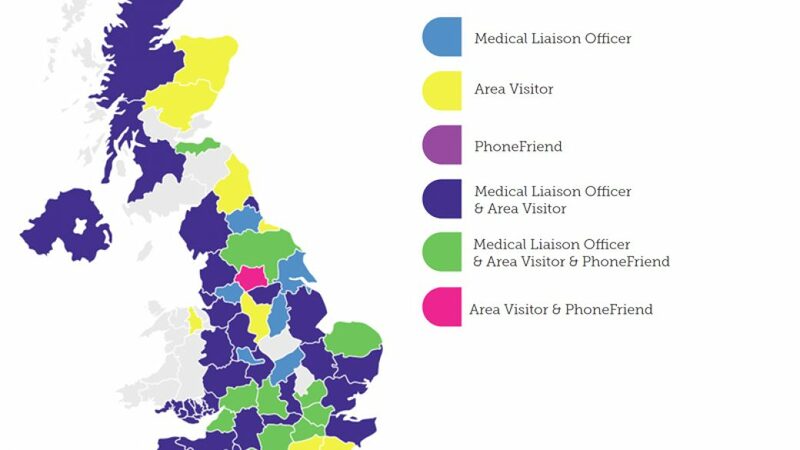 Above, you can see our Doctor Support Network map, showing our Volunteer coverage in counties across the UK. You can also download a more detailed map with volunteer figures for each county below, and find out more about our volunteer roles. The RMBF’s Area Visitors visit our beneficiaries and applicants at home. They help our beneficiaries understand the kind of support that the RMBF can consider and also help our Casework team to understand the needs of the beneficiaries. All our Area Visitors are volunteers and many of them are from the medical profession. MLOs are doctors who use their medical experience and contacts to help raise the RMBF’s profile by helping to ensure all those who may need the RMBF know where to turn. They liaise with hospitals, medical centres and societies in their area, and keep us up to date with the issues affecting doctors and their families locally, so our help remains relevant across the UK. The RMBF provides a telephone befriending scheme. Our PhoneFriends are there to help our beneficiaries feel less isolated and to make sure that we are providing the best possible care. The RMBF’s local community fundraising volunteers are arranged into Guilds. Each year the Guild volunteers organise local fundrasing events and help spread the message about the RMBF.